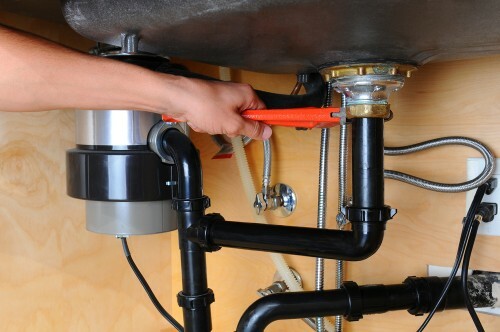 Repair or Replace Your Broken Garbage Disposal Today! Call the Best Plumbers in Torrance, CA, for Top-Rated Plumbing Service 24/7. Household garbage disposals are great plumbing appliances. They make food cleanup easy and prevent nasty odors and bacteria from forming in your trash cans. But, like most plumbing appliances, they also come with their fair share of frustrations. When a disposal stops working, it can lead to clogs in your kitchen sink and also cause plumbing leaks to form, creating costly repairs. At Torrance Plumbing and Rooter, we answer phone calls from homeowners, renters, and landlords every day who are concerned about the operation of their disposals. 90% of the time when a garbage disposal stops working it just needs to be reset. The reset button is located on the motor of the disposal underneath the kitchen sink. But, when this quick fix isn’t an option, you may need professional plumbing service to help you out. That’s where we come into the picture. Our highly rated, plumbing specialists are experts at garbage disposal repair and installation. They have the skills, training, and specialized knowledge to make repairs fast and for less than other plumbers in Torrance, California. When you call our repair line, a plumber will discuss the problem with you, offering maintenance tips and easy remedies to get your disposal working again. If these suggestions don’t work, he or she will schedule a time to come to your home to personally inspect the problem. If you press the reset button on the disposal’s motor and nothing happens, all is not lost. You still may be able to fix the problem without a plumber’s help. First, turn off power to the disposal, grab a flashlight, and peer into the disposal. What do you see? Many times a disposal stops working because a foreign object is lodged in the blades. If you can identify this as the problem, use a wrench or a pair of pliers to wiggle the object free – NEVER STICK YOUR HAND IN THE GARBAGE DISPOSAL. After removing any objects from the disposal, try starting the appliance again. If it still doesn’t respond, you should call a plumber for professional advice and repairs. The problem could be something as simple as a loose connection, or something that requires a new disposal like the motor is simply burnt out. No matter what the situation is, you can count on us to offer you practical solutions that are budget-friendly and always covered by our customer satisfaction warranty. Call today for quotes for all plumbing services including toilet repair, sewer line cleanout, and more!